It was Week 1 of an 8-week training program for the Tufts 10k for Women and let me tell you—it was quite the week! 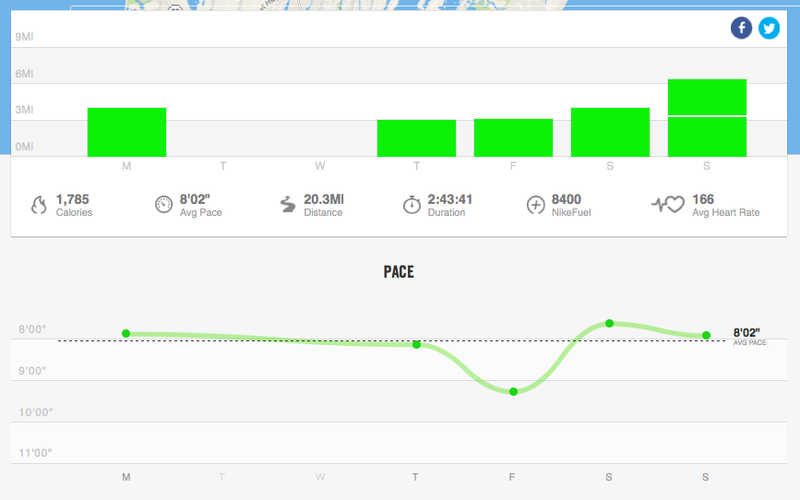 For what was turning into an off year for me in terms of running and training, a little Falmouth Road Race weekend inspiration was just what I needed to get me motivated and back on track. I decided awhile back that my goal race of the year was going to be the Tufts 10k. The last couple years, I planned my year around a spring and fall half marathons and marathon but I started out 2014 with some unexpected stitches and couch time so I wanted to make this a fun year of 5ks and road races. The first and only time I ran the Tufts 10k (or any 10k for that matter) was shortly after knee surgery when Lizzie had to pretty much carry me to the finish line. I am hoping this year is different! The week started out pretty normal. Well if you consider seeing a mermaid in your new neighborhood normal! (That’s another story...) Anyway, my mini vacation started on Thursday with a perfect little overnight trip to Chatham with Lizzie and her friend Kelly. Friday night was the 3rd Marathon Sports Mashpee Pub Run. The Mizuno sponsor had car troubles but Marathon Sports did not disappoint with the post-run snacks and drinks. Saturday we took advantage of tax free weekend and I was able to send some time by the pool. As a Falmouth Road Race “alum,” this weekend was like a big family reunion. From former staff members, current staff members, volunteers, elite athletes, and friends, it’s always nice to see everyone and catch up in between the craziness that is race weekend. It was super weird, sad, awkward, etc. not working or volunteering but FRR, you couldn’t keep me away. The Falmouth Mile is one of my favorite events of the weekend. This year they added a youth mile to go along with the high school, wheelchair and elite races. Let’s be honest, the only reason I go is to see old friends and watch the elites. They are freaking fast and so much fun to watch. This year five men broke 4 minutes on my high school track and the women’s race was stacked with amazing talent. I was so happy Eilis aka Shadizzle was there and we got to hang out and reminisce. Another highlight was introducing my dad to Meb Keflezighi. I first met Meb back in 2007 and his brother Hawi shortly after. They are both awesome guys. I actually convinced Hawi to run Falmouth back in 2010 and it seems like that runs in the family because my dad challenged him to run in 2015. You have some work to do Hawi to redeem yourself—I’ll be checking in with you and your training! My parents and I last saw him at the Chicago Marathon in 2012 and the next week my dad started running. His interest in the sport has grown and like the rest of America, he’s been inspired by Meb. I can tell that made my dad’s day so that made me very happy. Road Race morning was strange. Everything is so different now. I didn’t set an alarm. I tried to sleep in but like I said, I couldn’t stay away. It was a 6 mile “long run” day for me and I haven’t found any long run routes in my new hood yet so I drove to my parents house in Falmouth. Timing was perfect. I ran the 3+ miles to Falmouth Heights with about 5 minutes to spare before the elite women crossed the finish line. I was pulling for a Molly Huddle win as she’s been on fire this summer but she ended up in third after a tough battle in the heat and humidity. Fantastic week. 2015, I’m running. And so is Kelly, Allie, Hawi, and my daddo. Who’s with us?